What Does Code P215A Mean? When a P215A code is present, it means that the powertrain control module (PCM) has detected a discrepancy between one or more wheel speed sensor/s and the vehicle speed sensor. This discrepancy could be a voltage signal in which one sensor reports higher than normal, lower than expected, or it could be erratic in comparison with the other/s. Despite the fact that both these sensors are designed similarly, and they both detect vehicle speed, the vehicle speed sensor (VSS) and the wheel speed sensor (WSS) are separate parts of different networks. Both the VSS and WSS are electromagnetic sensors that utilize some type of toothed reluctor ring wheel or gear that is mechanically affixed to an axle, transmission/transfer case output shaft, or driveshaft. As the axle spins, so spins the reluctor device which completes a magnetic circuit. As the reluctor passes by (in very close proximity to) the sensor, the notches in the reluctor create interruptions in the sensor circuit. These interruptions are received by the PCM (and other controllers) as wave form patterns. The faster the wave form patterns are input into the controller, the higher the estimated vehicle speed. As the input of wave forms slow, vehicle speed estimation (as perceived by the controller) decreases. These input signals are compared (between modules) via the controller area network (CAN). As the PCM monitors vehicle speed using input data from the VSS, the antilock brake control module (ABCM) or electronic brake control module (EBCM) monitors input data from one (or more) wheel speed sensors. While most OBD-II equipped vehicles utilize a four-wheel antilock brake system (ABS), there are still vehicles that have a rear-wheel only ABS. Rear-wheel only ABS vehicles are almost exclusively rear-wheel drive vehicles. Vehicles with a four-wheel ABS have three or four wheel speed sensors and vehicles with only a rear-wheel ABS have only one or two wheel speed sensors. Typically, vehicles with a rear-wheel ABS system and a fixed rear axle design will have just one wheel speed sensor. Rear-wheel only ABS systems, on vehicles with an independent rear axle design, will usually use two sensors. Four-wheel ABS vehicles with a fixed rear axle will normally use three sensors and four-wheel ABS vehicles with an independent rear axle design will have four wheel speed sensors. The ABCM and EBCM monitor WSS input signals and compare them with each other and the input signal from the VSS (in the transmission). If there are discrepancies between the individual wheel speed sensors, an antilock brake code will be stored and an ABS malfunction indicator lamp should be illuminated. Only in the event of a discrepancy between one or more wheel speed sensor/s and the VSS will this code be stored. What are the common causes of code P215A? What are the symptoms of code P215A? How do you troubleshoot code P215A? Some type of appropriate diagnostic scanner (or code reader), a digital volt/ohmmeter (DVOM), possibly an oscilloscope, and a manufacturer’s service manual will be helpful when diagnosing this code. I would begin my diagnosis of a P215A code with a visual inspection of system wiring, speed sensors, and connectors. I might continue with an inspection of the battery, battery cables, and battery terminal ends, as a low voltage condition may cause this type of code to be stored. This is a good time to make sure that the alternator is charging sufficiently, as well. Clean, repair, or replace corroded battery cables and battery cable ends as required. Corroded, damaged, or burnt wiring, connectors, and/or components should also be repaired or replaced, as needed. Fuses and circuit breakers should be tested and replaced (as needed) at this time, as well. System fuses that appear to be operational with the vehicle in the “key on engine off” (KOEO) position will sometimes fail when the circuit is placed under a load. Testing system fuses with the vehicle in the “key on engine running” (KOER) position, and as many functions as possible in operation, may prevent a diagnostic misstep. Retrieving and making a notation of all stored trouble codes and available freeze-frame data, before clearing the codes, may prove helpful as your diagnosis proceeds. If other vehicle speed and wheel speed codes are present, diagnose and repair these codes before attempting to diagnose this code. I would continue by using the scanner data stream to observe wheel speed and vehicle speed, simultaneously, while test driving the vehicle. Narrowing the data stream to display only these fields will increase the accuracy at which the desired data is displayed. Watch for inconsistent or erratic readings from any of the wheel speed sensors or the vehicle speed sensor. This information may help you to narrow the general area of the system malfunction. Once you have determined which sensor is malfunctioning, you may use the DVOM to perform a resistance test on the sensor in question. Consult the service manual to find the manufacturers recommended specifications for each sensor and replace sensors that do not comply. If all of the sensors comply with manufacturer’s specs, you may use the oscilloscope to retrieve live data from each individual sensor. You will need to jack or hoist the vehicle in a safe manner to perform this type of testing adequately. 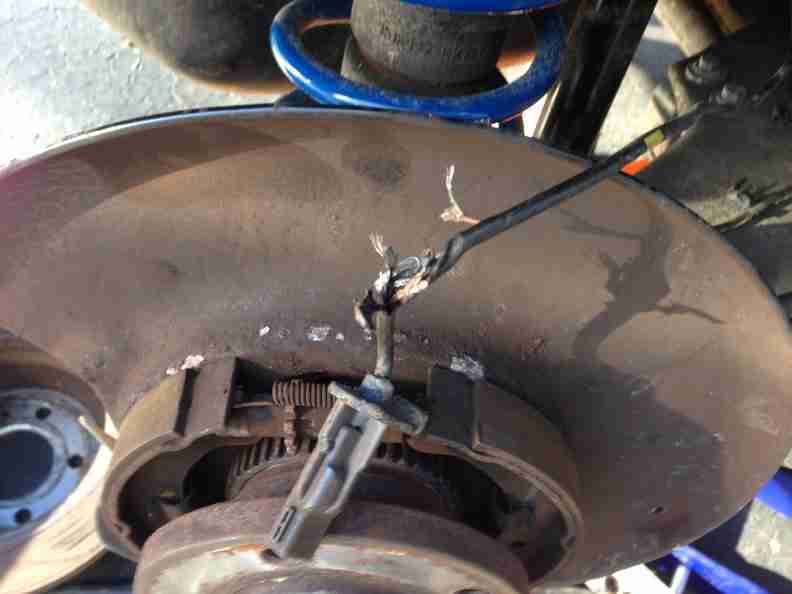 Wheel speed sensors and sensor wiring harnesses are frequently damaged when brake repairs are performed. If this code is presented immediately following such a repair, suspect a chafed or otherwise damaged sensor harness or sensor. When performing resistance and continuity testing with a DVOM, always disconnect electrical connectors from related controllers. Failure to do so could result in a damaged controller. None found. Ask a question about P215a.